Caption slip reads: "Photographer: Emery. Date: 1953-04-12. Reporter: Emery to Gene Cowles. Assignment: Sailor back from Korea service locate family after 12-hour search. 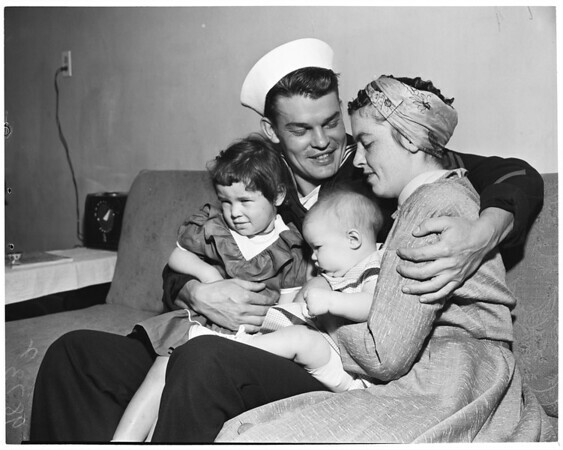 70-71-72: James Lee Nunn, 25, Electrician's Mate 1st [Class], with wife Norma Jean, 24, and the daughters Sherry, 3 yrs., who has chickenpox and Joanne, 7 1/2 months. his reunion & first meeting of Joanne & father was at 1128 Arcadia Court, Long Beach."